There once was a place called Fastener Land. 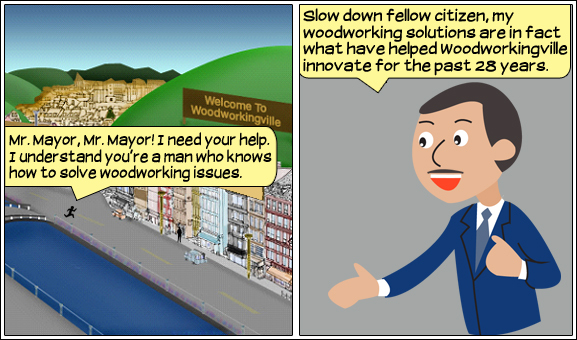 The capital of Fastener Land, Woodworkingville, was founded by Mayor Quickscrews over 28 years ago. What started as just a small village woodshop has blossomed into a prosperous and flourishing city. This shining example of innovation and creativity has set the standard for woodworking across all of Fastener Land. Now, Woodworkingville’s New Online Store - www.quickscrews.com - sells and ships to and from within all of Fastener Land, same day or next. 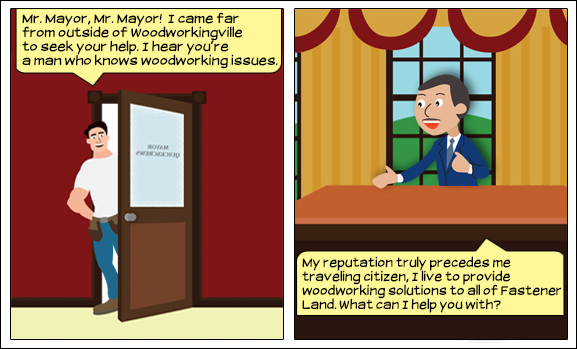 Come relive the journey over the next few weeks as we share the recent history of Woodworkingville, the tale of its Mayor, and how both have become sources of inspiration and innovation for all citizens of Fastener Land... and places far beyond. Mayor Quickscrews was walking down the street when all of a sudden he heard someone calling from behind him. “Woodworkingville’s local online store, www.Quickscrews.com, carries screws with just the features you are looking for: Nibs and Type 17 Auger Points. The Nibs allow the head to create a countersunk hole and sit flush in whatever material you’re working with. The Type 17 Point at the tip of the screw is specifically designed to clean out the hole when drilling so that debris within the hole does not cause a split. “My reputation is beginning to precede me fellow citizen, I live to provide woodworking solutions. 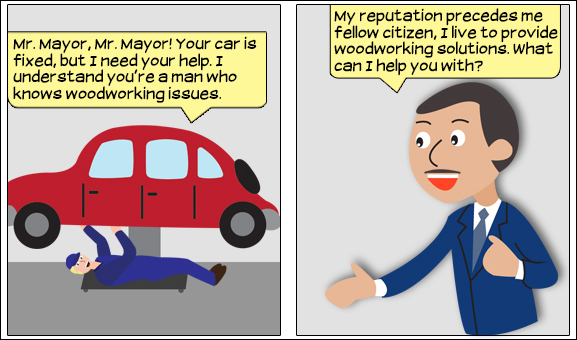 What can I help you with?” said Mayor Quickscrews. “So you’re saying the standard Type 17 lacks enough cutting power to eliminate pre-drilling in hardwoods?” Mayor Quickscrews asked. “RIght, and that’s the Hole point,” the furniture maker chuckled. “My reputation truly precedes me traveling citizen, I live to provide woodworking solutions to all of Fastener Land. 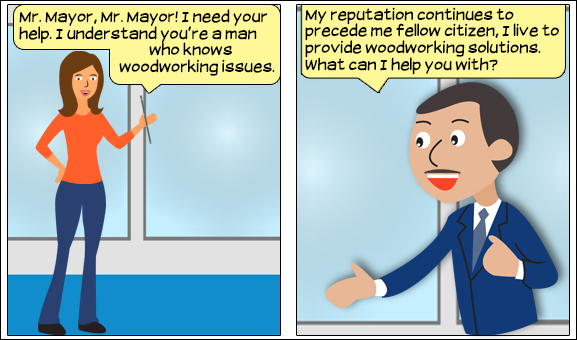 What can I help you with?” said Mayor Quickscrews. 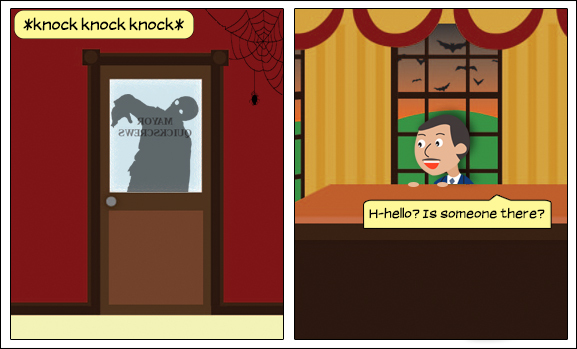 Late on Halloween night, Mayor Quickscrews was in his office when all of a sudden he heard a loud knocking on his door! Through his window, he could see the silhouette of a strange looking man... if he even was a man! Mr. Mayor hid behind his desk and responded timidly, "H-hello? Is someone there?" One of the cabinet shoppe’s apprentices walked into Mayor Quickscrews' office! “Uh-oh, that is scary, indeed!” Mayor Quickscrews responded. When overseeing a renovation project at the Spiral Point Mall, Mayor Quickscrews noticed a frustrated man surrounded by cabinets. The man spotted the Mayor and said, "Mr. Mayor, Mr. Mayor, I need your help! 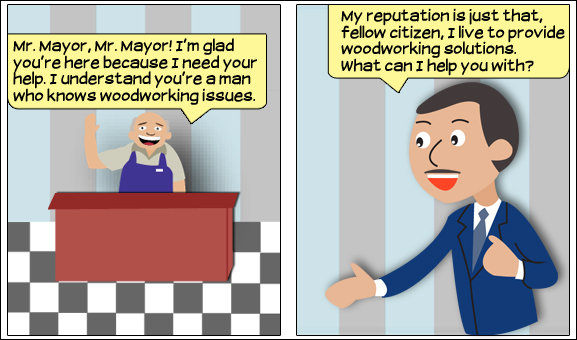 I understand you're a man who knows woodworking issues." 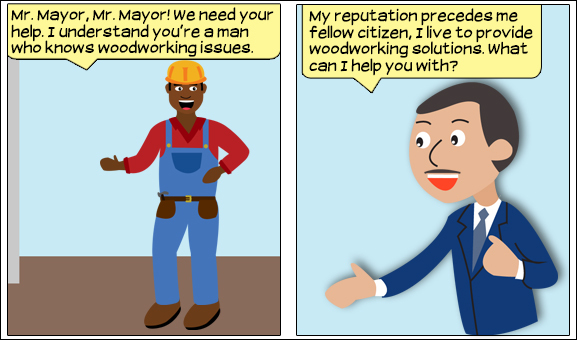 "My reputation precedes me fellow citizen, I live to provide woodworking solutions," Mayor Quickscrews recited, "Who might you be?" 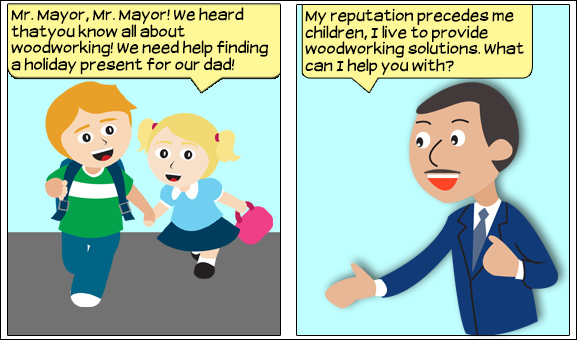 "I'm a commercial cabinet maker," the man replied. "Any commercials I've seen?" Mayor Quickscrews joked. 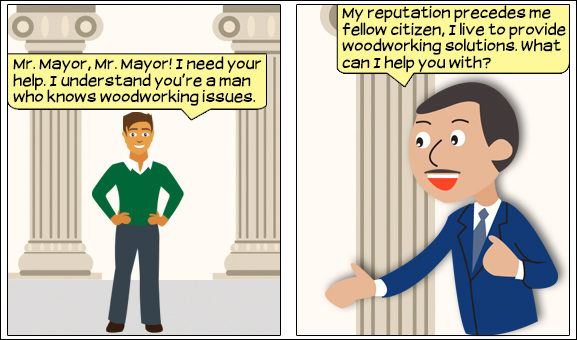 “My reputation continues to precede me fellow citizen, I live to provide woodworking solutions. What can I help you with?” said Mayor Quickscrews. “Like I always say, don’t get screwed, use Quickscrews. 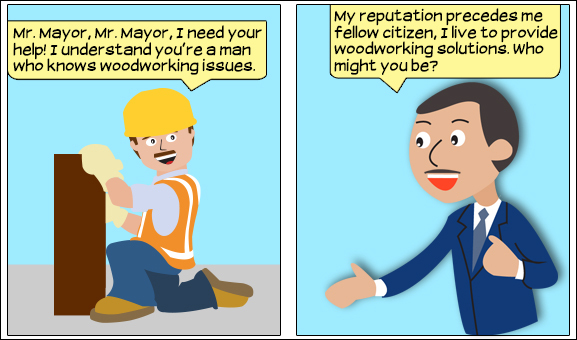 “My reputation precedes me fellow citizen, I live to provide woodworking solutions. 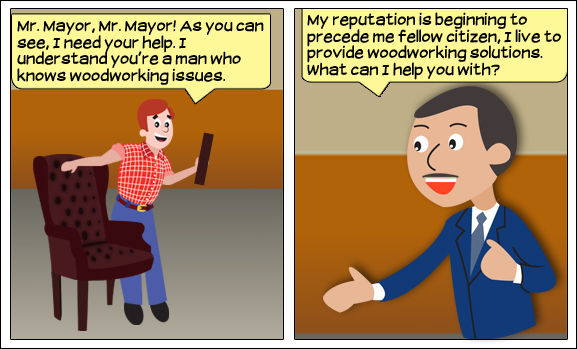 What can I help you with?” said Mayor Quickscrews. “Our dad loves woodworking and we want to get him a good present, but we don’t have very much money”, The little boy said as he pulled a ten-dollar bill out of his pocket. “Mr. Mayor! Mr. Mayor! We could really use your help,” said a man Mayor Quickscrews knew he recognized from somewhere. 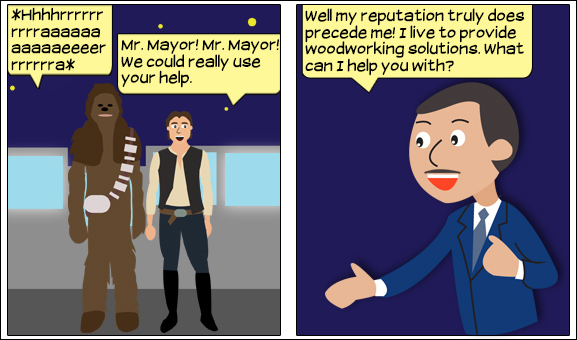 “Never tell me the odds, but thanks for the help, Mayor,” the man responded with a smirk. “We need ideas for last minute Christmas gifts! We are running out!” the elf responded frantically. “Oh that’s easy! No need to worry, just look at the Quickscrews Holiday Shopping Guide. We have the perfect gifts for any woodworker! 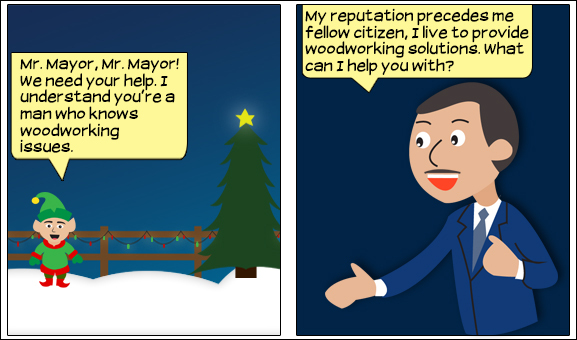 Bit Kits, Screwdrivers, fun tools... it’s all online!” responded Mayor Quickscrews. “Thank you so much Mayor Quickscrews! You definitely won’t be getting coal this year!” the elf replied while running back towards his workshop. 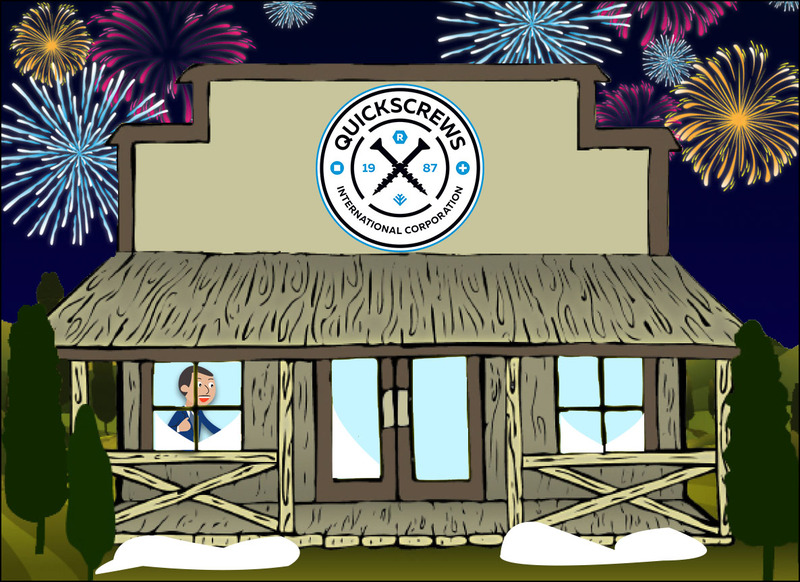 Mayor Quickscrews was at home celebrating New Year’s Eve with his closest friends and family and reminiscing on the last year in Woodworkingville.